After an abrupt introduction to big-time college ball his freshman year, Huskies QB Jake Browning will introduce a little savvy to his game as the 14th-ranked Huskies seek their best season in 15 years. College football openers always are rich in ambiguities because the annual turnover in players creates mystery, and the holdovers mature at different rates. When the preseason No. 14 Huskies host Rutgers Saturday (11 a.m., Pac-12 Networks) in Washington’s opener at Husky Stadium, one of the most compelling intrigues — how much QB Jake Browning has developed for his sophomore season — will begin to unfold. 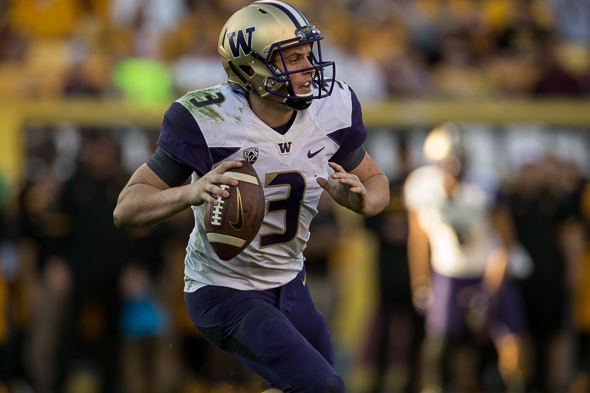 After winning the job a year ago straight out of high school — the first true freshman in Washington’s history to start the season opener — Browning had an up-and-down freshman year. It was good enough for a 7-6 record, including a bowl win, but his passing game needed work. The talented but inexperienced Browning completed 63 percent of his passes, including 16 touchdowns and 10 interceptions. The abrupt introduction to big-boy ball, Browning said, is paying off. Huskies coach Chris Petersen said it was difficult to evaluate Browning without seeing him in a game, but that his command of the offense was now rock-solid. “From this year at this time to last year, there’s a big difference,” Petersen said. “He knows everything we’re talking about with certainty. You’re hoping it’s all these little subtleties of how he moves in the pocket, how accurate he is, his command of the system. Browning need not be a one-man wrecking crew, breaking defenders’ ankles and torching coverages. The offense is built for substance over style. Petersen needs Browning to be the guy who keeps the vehicle running, not take joyrides. Washington’s offense has no shortage of talent, returning top rusher RB Myles Gaskin and WR John Ross III, a 4.25 40-yard dash speedster who missed last season with a knee injury. Ross rejoins a crew missing six of the top seven pass catchers from last year. A surprise absence is Brayden Lenius, whom Petersen said Monday was suspended for the season’s first three games for a violation of team rules. The 6-foot-5, 231-pound Lenius started six games a year ago and has 33 catches for 363 yards and three touchdowns in his first two seasons. For Browning, who set national high school records for career (229) and single-season (91) touchdowns at Folsom High School in his native Sacramento, accuracy is critical. A year of experience helps, but Browning said he spent the off-season working on deep-ball fundamentals. Browning’s efficiency likely won’t have many tests early because of the softness of the UW schedule — according to ESPN’s metrics, the Huskies’ games against Rutgers, Idaho and Portland State make for one of the easiest non-conference schedules in the country (125th). But when No. 8 Stanford rolls into Husky Stadium Sept. 30 for a what may be the game of the season for Washington, a serious test of Browning’s pursuit of simplicity and efficiency will be visible on a Friday night national telecast.